wings, delivering correct angles allowing for air to easily pass through reducing noise and unwanted turbulence. affect performance. The presence of the trip wire overall provides a more efficient and quiet fan environment. Upgraded one of the stock 120mm exhaust fans since there was room for a 140mm on the top of the case. Quiet and moves a lot of air. These are my front intake fans. They are silent and look nice. Nothing else to say. 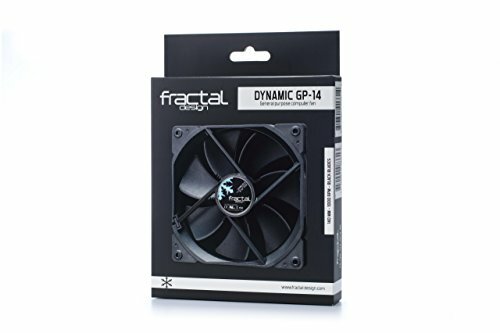 Best case fans I have used (Especially since I can use voltage control on my mobo fan header with software like speedfan to control speeds), the two 140mm Fractal Case fans I have are the ones that came with the Fractal Design Define R5 Case, which are the same as these except the fan blades are white. Super quiet, and the all black makes it really easy to incorporate into the build vs. the standard black and white Fractal fans. Quiet, nice to match with others in Meshify C.